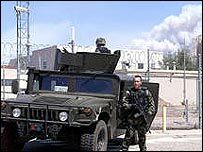 The FBI is investigating whether information from a US nuclear weapons laboratory was found in a police drugs search of a New Mexico trailer park. Police said that material recovered during the search appeared to come from Los Alamos National Laboratory. 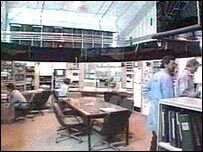 The lab, one of two US sites that carry out classified nuclear research, has a history of security breaches. The owner of the mobile home which was raided is said to be a former employee of one of the lab's sub-contractors. Police visited the mobile home park in response to reports of a domestic disturbance. They then carried out a search of the mobile home and a man was arrested for possession of drug paraphernalia. The authorities say they also discovered possibly classified information from the Los Alamos National Laboratory. In a statement the police said during the course of the search, officers realised that some of the items seized appeared to belong to the cutting-edge centre for nuclear weapons research. According to the head of the energy department's national nuclear security administration, investigators want to find out how the possible security breach could occur despite extraordinary efforts in the last three years to put strong security procedures in place at Los Alamos and other weapons facilities. Los Alamos was the home of the Manhattan Project which created the first atomic bomb in the 1940s. The lab has a history of high-profile problems, including breaches in security. The Governor of New Mexico, Bill Richardson, said the lab had made efforts to improve security - but apparently not enough.